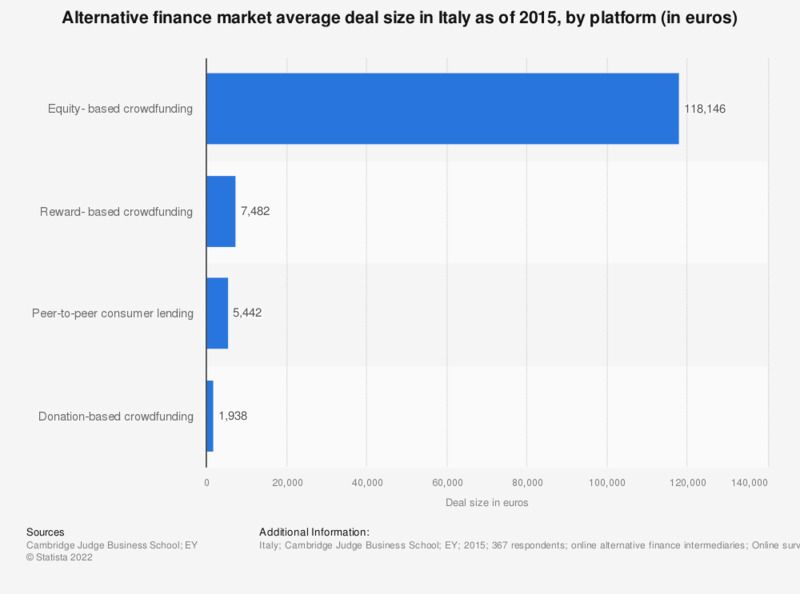 This statistic shows the alternative finance market average deal size in Italy as of 2015, by platform. It can be seen that the average deal size in reward- based crowdfunding equalled almost 7.5 thousand euros at that time. The source adds the following information: "This study gathered data from 367 crowdfunding, peer-to-peer lending and other online alternative finance intermediaries from across 32 countries in geographic Europe, out of which 273 platforms are currently operating outside of the United Kingdom. Utilizing this unprecedented industry dataset, which captures an estimated 90% of the visible market, we hope to shed some light on the state of online alternative finance in Europe." United Kingdom: When you budget for investing in debt-based securities, where does the money come from? What factors might make you feel more confident to consider crowdfunding as a method of raising funds?